You have no idea what madness is going on at the police station, but Winnie the Pooh and a human-sized voodoo doll will tell you all about it. A recent Advocate article is titled: “At Stamford police department, every piece of evidence tells a story.” As you can guess, it’s about items stored in the evidence room, including an arrow (?) used in a murder in 1976, a shovel used to bury a body, and... a stuffed Winnie the Pooh. A few items [police sergeant] Rondano has chosen to keep. A stuffed Winnie the Pooh overlooks the front of the property room… Rondano tells a story of a burglary suspect returning to a house to take this bear, only to be arrested. If he had only left the bear, he would have escaped. Rondano keeps the bear to comfort children who come through on tours. What the- you're keeping a stolen Pooh bear to comfort children? If kids are young enough to be comforted by Pooh, they are too young to be in a room with a baseball bat that was used in a beating! Tours also include a glimpse at a variety of weapons: real, homemade and toys that bear a frightening resemblance to the real thing. Unsuspecting kids are glimpsing frightening (but crafty-sounding!) weapons, and I’m glimpsing frightening syntax: you cannot use the words “toys that bear” right after a bizarre toy bear story. Toy bear, toy bear! I can’t even tell if we’re talking about weapons or stuffed animals anymore. Other items can be kept for different reasons. Since being found in a parking lot, a human-size voodoo statue near the entrance has remained. Rondano is hesitant to discard the statute because of its religious nature, but no one wants to take it - possibly for the same reason. The Stamford Police have a giant voodoo doll- a weapon of terror, really- leaning against the doorframe, welcoming the children on tours. Pooh! Help! I’m left in amazement. We live in an astonishing world, a world in which we can stumble upon a voodoo doll in a parking lot, and where educated adults choose to keep that doll around their workplace. Our city has an officially documented doll used to cast spells. This doll is as big as we are, and the police think the best thing to do with it is show it off. 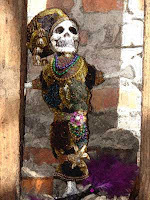 I’m tempted to suggest we use it as a mascot, or as a prop in parades, but like the cop says, you don’t mess with voodoo. I’ve got to see this doll, or I won’t be able to concentrate on anything else ever again. What does the statue look like? Is it like a shrunken head, or a scarecrow made with cloth, or a piece of paper? I think the reporter needed a lot more detail there. Did she see the doll? I don’t think she did, or she would have had more to say. Who knows what other mysteries exist in Stamford? I am thankful to reporters for uncovering them, because this is the kind of gossip I like.